While the pasta is cooking prepare the other ingredients, chop the romanesco into smallish pieces but leaving a few larger florets for presentation. Heat a large fry pan medium heat, add the coconut oil, then your onions, cook for about 5 minutes until softened. Add the garlic and your chopped romanesco along with 150ml of water. Cook for another 8 minutes until the cauliflower begins to soften,and break down add the dates and nutritional yeast. Using tongs drag the pasta into the fry pan with a ladle of pasta water, stir well with the tongs to mix, you may need another ladle of pasta water. Once the pasta has come together take off the heat, mix through your olive oil and chopped mint. If you reserved some florets for garnish, lightly steam these and add to the finished plate. 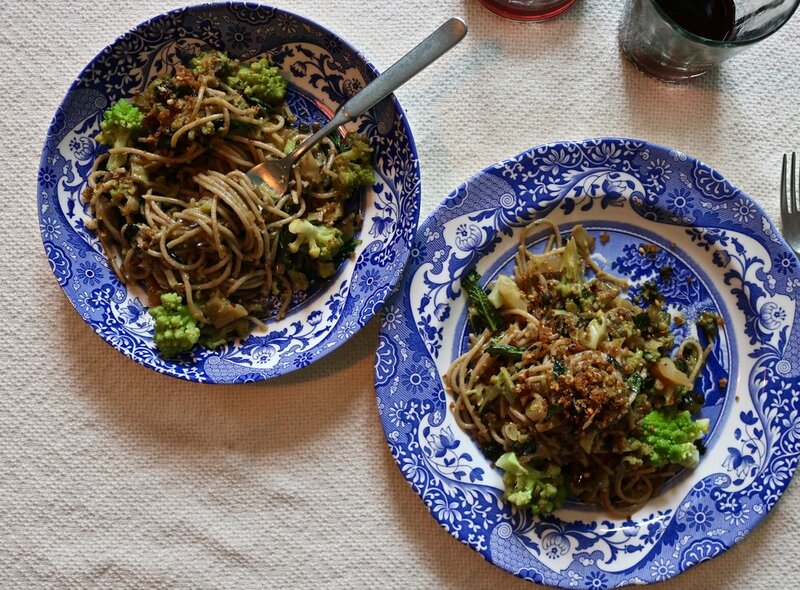 A sprinkle of garlic breadcrumbs is a nice touch but not a must! Finish with a sprinkle of garlic breadcrumbs.